« VHS and DVD Sale! 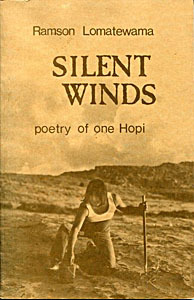 Silent Winds: The Poetry of One Hopi. This slim volume by Ramson Lomatewama, poet and teacher, speaks of people who live “in a place where people live by faith and sweat.” This copy is a signed first edition. Poems include “Rain Song”, “Seasons”, “Cloud Brothers” and many more. A must for collectors of Native American poetry. Buy this book from me at Abe Books.